If you are looking to try something new in the lipstick category, Revlon’s Ultra HD Matte Lipcolor is something new and unique. The smell of the product is great – a vanilla-like scent, but doesn’t have much of a taste once applied. The formula glides on smoothly, and once it dries you can see the matte effect. I’d recommend applying chapstick or a lip moisturizer beforehand, as my lips tended to dry out after a couple hours and I didn’t want to mess with my lipcolor. The feel of the product is light and once it is dry you don’t even notice it. It lasted almost 4 hours for me, but then it started to fade and come off a bit. Definitely not an all-day lipcolor, but the matte effect is a fun chance – I even received a compliment on it while I was out! 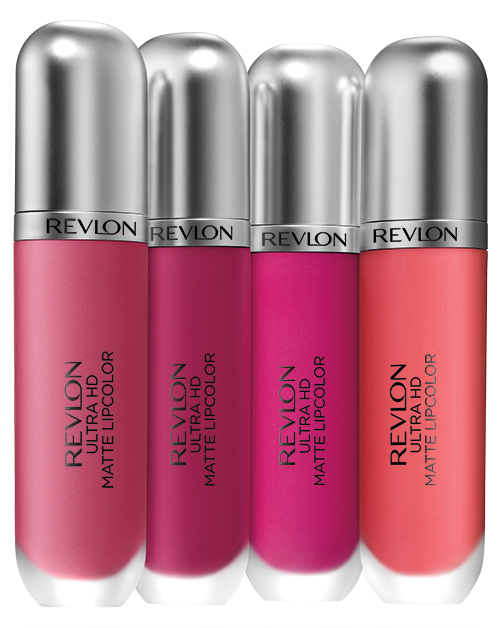 I’d definitely recommend Revlon Ultra HD Matte Lipcolor for a fun, new chance of pace product. As summer approaches, I’ve been looking to try some of the new sunscreen options out there. I found Hawaiian Tropic’s Silk Hydration Weightless formula, which sounds like it may be lighter and less greasy than some of the thicker formulas. At first application, the smell is great, just like previous Hawaiian Tropic products I’ve used. The feeling of the lotion is definitely easy to apply, lightweight and absorbs into skin quickly which is always important when you don’t want to wait for your sunscreen to dry before you jump in the water. After a couple hours of fun in the sun, I was protected and did not receive any sunburn which I was happy about. Make sure you pay attention to which SPF you choose, as the product comes in both SPF 15 and SPF 30. If you are fair-skinned, you may want to be careful if you are out all day with only SPF 30 protection. Just make sure to reapply often and you should be fine. The weightless-ness of this formula, with a non-greasy feel and great scent make it one of my go-to sunscreens this season. If you have dark blonde hair and want to go a bit lighter, this is the shampoo for you! I have naturally blonde hair that is darker at the top/roots, and can sometimes get a bit brassy. Looking for a way to lighten up a bit for summer, I decided to try John Frieda’s Go Blonder Shampoo. After the first use, I honestly didn’t notice a huge difference. The shampoo smells great, and cleanses perfectly, leaving my strands nourished and shiny. I stuck with the shampoo for a full week, and it definitely made a difference! The longer you use it, the brighter the results will be. My hair is at least a full shade lighter, and the ends (which were lighter to begin with) are probably two shades blonder. I’d definitely recommend this shampoo if you are looking for a summer touch-up and want to skip the salon and pricey highlights. 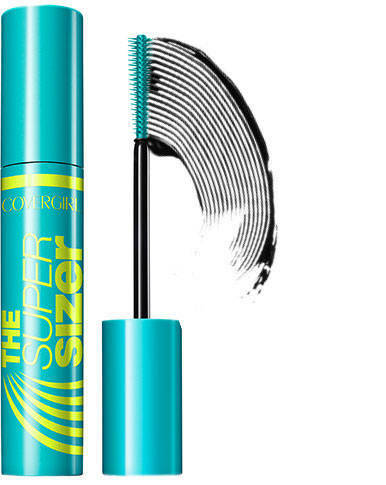 As a woman with naturally thin lashes, I was so excited to try CoverGirl’s The Super Sizer Mascara. Promising 400% more volume and “fanned out lashes”, the mascara sounds like the perfect fit for someone like me. Upon first use, I found that the formula results in minimal clumps, and has a nice texture. The brush is a bit small in my opinion, but it does a great job at reaching each and every lash. The formula is also perfect if you like to go over your lashes 2-3 times with additional coats. After an entire work day, the mascara stayed on flawlessly and still looked great. My lashes did appear to be more voluminous than my previous mascara, although not sure they had any more length than before. The only con that I encountered was at the end of the night when it came to removing my eye makeup. The mascara was harder to remove than some of my other products, and actually pulled out a couple of my lashes. I’d definitely recommend investing in a good eye makeup remover, and the problem should be solved. 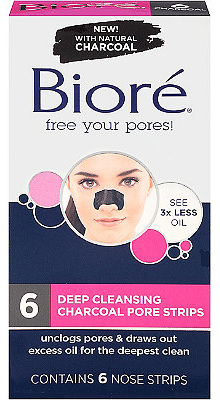 Since I’ve noticed that charcoal skincare products have started to become all the rage recently I decided to give these Biore Pore Strips a test. Lets face it, everyone wants their pores to be smaller—or invisible—so here’s one beauty blogger’s two cents on these charcoal pore strips. I was careful to follow the instructions as it had been a while since I had used any type of pore strips. These ones require you to put them on and add a bit of water to moisten. I left them on for the allotted time – 10 minutes, and everything was good. However, when it came time to remove the strip it was very difficult to get off, and it left dark a black charcoal mess on my face. To be honest, that was almost enough for me to throw the rest of the box away. But I did notice a little improvement in my skin. My pores did look better temporarily. But since it was such a process and hassle from beginning to end, I will be continuing my search for a good pore shrinking product.